Once in a while a film comes along that won't sit in a nice convenient box. 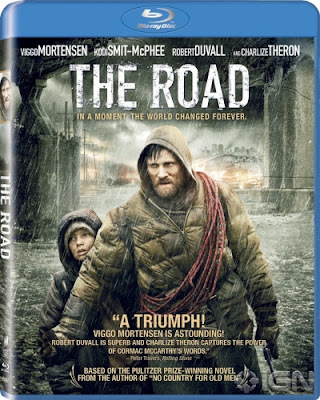 The trailer for The Road , pre cinema release, tried to play it as a sort of survival horror style film and it would have put many off, not least the fans of the book by Cormac McCarthy. This post apocalypse tale of a man and his son is so much more than than that though. Viggo Mortensen's puts in a superb performance as the unnamed man dragging what's left of his family and possessions across America desperately trying to get to the coast as winter draws nearer. The world has been laid to waste by an unspecified event several years before, the colour palette of the film shifting from grey to even greyer, the rare flashes of colour a shock to the eyes. There are few survivors and those that are alive are starving, desperately searching for food or resorting to cannibalism. The father and son's walk to the coast is interspersed with brief flashbacks to 'before' the event, where Charlize Theron delivers a compelling turn as the mother. Gorgeous before the disaster but during the flashbacks, post the disaster, a broken woman who's given birth to a child in the most inhospitable environment. Although she plays only a small part in the film her presence is felt throughout. The son is played by Kodi Smit-McPhee with a maturity beyond his years. A boy following his father, at times desperately needy, but later in the film making his father look at his actions and question his behaviour. It's an impressive performance in a film clearly aimed at a very adult audience. This is not an easy movie to watch, as well as the constant fear of being attacked by the 'bad guys', throughout one is left wondering how terrible things have to become before the man must kill his son and himself, with his two remaining bullets, to save them from their own existence or a fate worse than death. At one point the pair stumble on a group farming other people for body parts. This is not a pleasant land, but throughout the boy is a ray of hope and decency, haranguing his father to help some of the people they stumble upon as they walk. Director John Hillcoat creates a thoroughly believable post apocalypse world by not taking us into a city. This is backwater USA, the countryside is bleak and inhospitable with all signs of life removed and the CGI is kept to a minimum with clever lighting used to remove sunlight and create an impression of constant cloud cover. The boy and his father's journey is incredibly touching, all of the performances are stand out and the films utterly bleak tone make this a must see. The brief moments of hope keep you watching and as depressing as it could be, some how it isn't. The son's faith in his father and the father's believe in the importance of staying alive compel you stick with it until the end, even if your fear of that being an awful end fills you with a sense of dread throughout. Is there an issue of never finding out why civilisation has been almost entirely wiped out? No, it makes perfect sense within the context of the story. So many 'disaster' movies are about the 'event' but here not finding out what has caused it, whether it's man made or natural, turns it into a story about a man and his son rather than a morality tale. It is also true to Cormac's book. What ever you saw of the road in trailers a year or so ago, forget. If you didn't make it to the cinema to see this, rent it. Bleak? Yes. An film that deserves your attention? Absolutely. It's been removed for violating terms and conditions! I called it in May 2009.